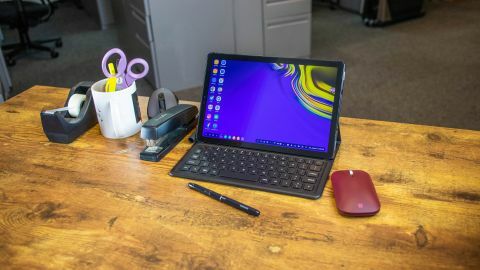 The Galaxy Tab S4 is an attempt to push Android tablets to the next level with 2-in-1 desktop-like software, and while it's what we want to see from even the iPad, the idea doesn't automatically make it the best tablet. It has a premium price tag, the touchscreen response needs work in Dex mode, and too many apps aren't optimized. The Samsung Galaxy Tab S4 is the only Android tablet that can be labeled as a true 2-in-1 that serves as a tablet and offers laptop-like mobility. Notably, it's not as affordable as other Android tablets in the market either, reason being its high-end hardware and abundance of productivity features. Although it's an useful feature, the Dex still feels like work in progress. For instance, the touch interface isn't as touch-friendly, and for laptop like operations you need to invest in the optional keyboard cover which does not have a trackpad. You need to pair a Bluetooth mouse to navigate through the Dex interface. The specs lie a little bit: it actually doesn't matter that the tablet is underpowered on paper with an early 2017 chipset that’s easily outpaced by Apple’s laptop-rivaling chip speeds. They may not be refined but the Tab S4 introduces a lot of futuristic ideas that look like heading to the right direction. Since we don't have the Microsoft Surface Go or Chromebooks in India, Samsung still has a huge market to tap in. But is it worth the asking price? It's simple, you either need the S Pen or a Bluetooth mouse to operate the Dex mode without an issue. Samsung’s core software works fine, but apps as popular (and as standard) as ones from Google should work without crashing. Google Docs crashed several times while we wrote this review on the Tab S4. We did connect a Bluetooth mouse to get the best out of productivity, and to be honest, it worked well in both Dex and normal modes. However, it's not ideal on a commute or at a tight space. Given the size size of the tablet, the keyboard feels slightly cramped until you get used to it. It isn't backlit either, which means you have to use the light from the display in darker conditions.